GCA Altium has advised the shareholders of IESA, a B2B digital disruptor providing value-added services to manufacturing, process and production oriented industries, on its £88 million sale to £2.8 billion market cap* global multi-channel distributor Electrocomponents plc (LSE:ECM). Founded in 2002 and headquartered in the Birchwood Science Park near Manchester, IESA employs c.500 people. The company provides value-added services across three key areas comprising procurement and sourcing, transaction processing, and inventory and stores management. IESA's services allow clients to improve their efficiency and consolidate their indirect vendor base via a cloud-enabled marketplace solution. Its award winning platform was developed specifically to meet the indirect procurement challenges of large-scale clients, integrating over 27,000 approved vendors with its proprietary marketplace and offering its client base complete invoice consolidation for all transactions. The acquisition of IESA will enhance and accelerate Electrocomponents' value-added services offering, giving it additional capabilities to service corporate clients who choose to outsource their MRO and other indirect purchases and inventory management. IESA's fully integrated indirect supply and comprehensive stores solutions complement Electrocomponents' existing product and value-added service capabilities resulting in a full service end-to-end solution for clients. Phil Adams, CEO of GCA Altium, said: "We are delighted to have been able to work alongside Gresham and the IESA management team. 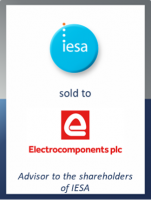 With its extensive global coverage, Electrocomponents represents an excellent partner with whom IESA can accelerate its own international ambitions, leveraging its digital platform." This represents the latest GCA Altium transaction across the Industrials and Tech-enabled Business Services sectors.